Featuring Tori Darke, Roo Arcus, Aleyce Simmonds and Ben Ransom! Multi Award winning singer/songwriters Tori Darke and Aleyce Simmonds have joined together with Roo Arcus and Ben Ransom to create a show not to be missed. Tori and Aleyce have been dubbed as two of the most promising Singer/songwriters in the Country Music Industry today and their chart topping singles only confirm this. 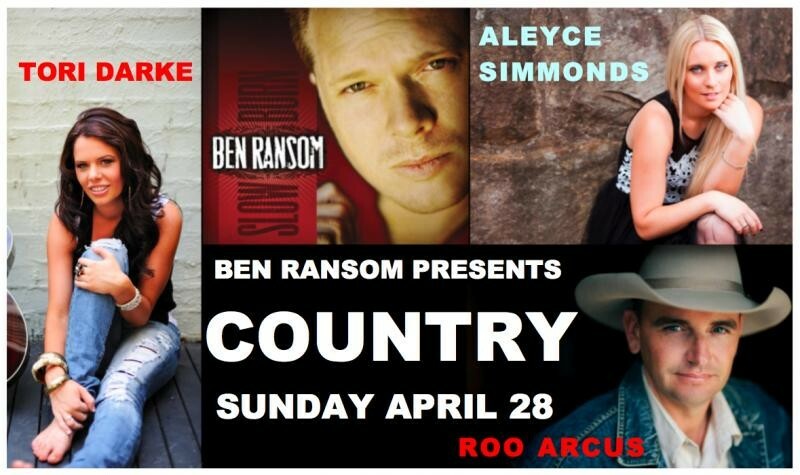 Add to the mix one of the finest voices in country Roo Arcus and powerhouse performer Ben Ransom and you have yourself an incredible afternoon of sensational entertainment. In 2012 Tori Darke achieving chart success on radio nationally, embarked on a successful songwriting trip to Nashville, performed to Australian troops in the Solomon Islands and performed at all the Major Australian Country Music Festivals. With a sell out ticketed show at this years Tamworth Country Music Festival, Tori is an undeniable fan favourite. Winning the award for Female rising star at the 2011 Australian Independent Country Music Awards of Australia made the masses again stand up and take notice to the 2005 Telstra Road to Tamworth Winner, Aleyce Simmonds. Gaining 3 x finalist berths at the 2012 Country Music Awards of Australia confirmed what many key industry people have been predicting. Aleyce is a talent not to be ignored. Both Tori Darke & Aleyce Simmonds, recently performed at the prestigious Event, CMC Rocks The Hunter, alongside international artist, The Band Perry, Big & Rich, Rascal Flatts, Chris Young & many more. Roo Arcus is one of Country's 'New Traditionalists' with one of the best voices in modern Australian Country Music. His stunning album 'This Here Cowboy' is testament to this! Roo's songs resonate with authenticity and it's easy to see why this man's extraordinary talents have earned him a string of awards and Golden Guitar nominations! The afternoon will be hosted by Ben Ransom... With powerful vocals and infectious melodies, Ben has all the hallmarks of a classic Australian artist and performer. His stunning debut album, Slow Burn has just been released and is chock full of amazing songs including the hit singles 'Truck Stop Honey' and 'Bourbon & Sunsets'. Don't miss the chance to see these fantastic artists all under the one roof.